There are a ton of new features in Remote Desktop Services (RDS) in Windows 8. It is clear that Microsoft is taking RDS again to the next level and also making it consistent with the Windows 8 client experience. At //BUILD the team presented on these feature in depth and I've outlined some of these features below to provide a preview of what to expect. Make sure to download the Windows 8 Consumer Preview and try it for yourselves! What are the system goals for Remote Desktop Services in Windows 8? Fast and fluid desktop experience, consistent with metro UI. Wide range of network conditions, including WAN and LAN. In order to accomplish the objectives above, Microsoft has spent a lot of time on RemoteFX. What is RemoteFX? 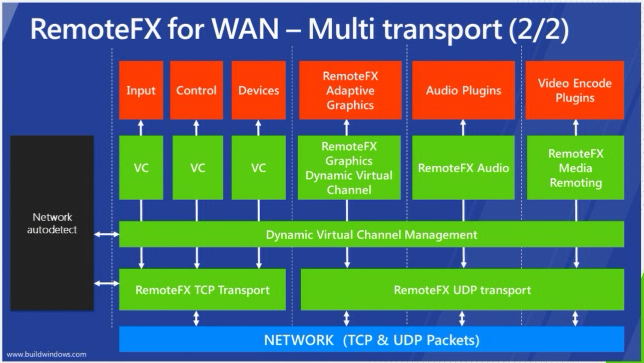 Remote FX is the name for the full, rich, multimedia capabilities within Remote Desktop Services. 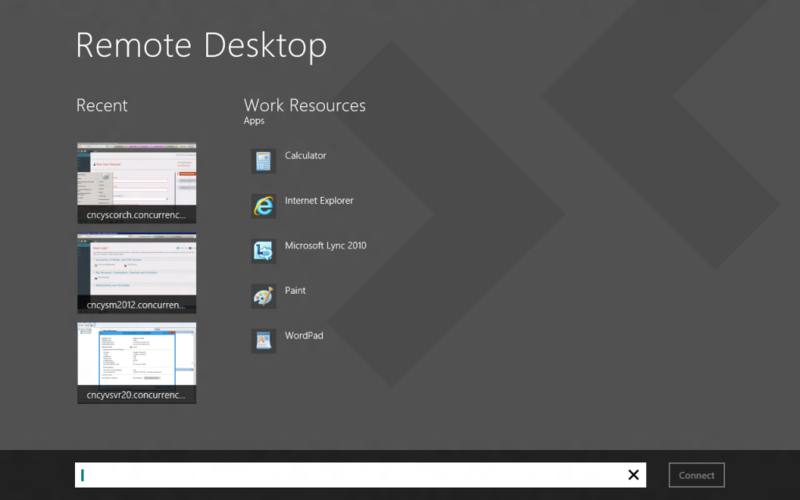 What's new in Remote Desktop Services in Windows 8? The key point here is that Microsoft is supporting a much richer remoting technology stack, including improved performance, compatibility, and features. It also provides a fully consistent experience with the touch-centric metro interface, whether a user is using a local tablet, or remoting to a Remote Desktop Services host in Windows Server 8. Here is a shot of the new Metro RDP App. You'll notice the "work resources streamed from the corporate RDS feed, as well as recent desktop connections. You can see how this interface works well with a touch interface, as well as provides seemless access to work applications without installation. How has the RemoteFX graphics architecture been modified to address these needs? 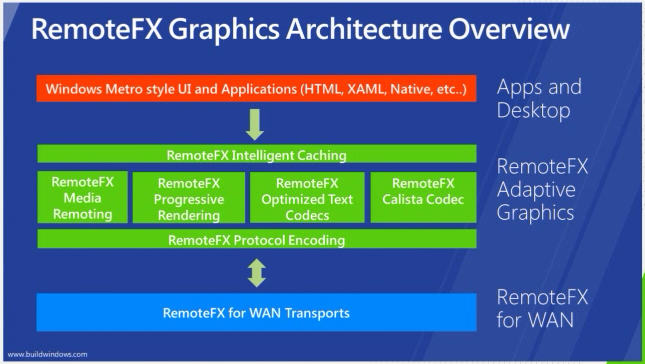 As you can see the diagram below, the RemoteFX feature set at the graphics level has been drastically improved, including media remoting, progressive rendering, optimized (and segmented) text codecs, and the calista codec (USB). This is combined with improved transports for use over WANs. I'd say that perhaps one of the most important components, especially as the Remote Desktop Services capabilities are used more often by users through Remote Desktop Gateways, is RemoteFX over the WAN. This set of functionality isolates the traffic and auto-detects performance goals. Here is the original configuration of RemoteFX (note that it uses TCP transport for all services). Here is the improved RemoteFX for WAN. It isolates traffic to the optimal transport.